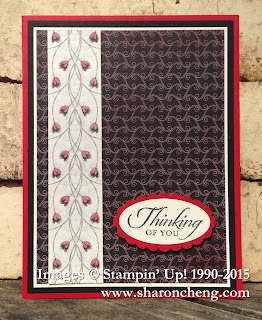 These 3 cards use Stampin' Up! 's Timeless Elegance Designer Series Paper, one of the most versatile papers in the 2015-2016 catalog. I made these cards to fit 2 of the October Splitcoaststampers Challenges. One is to use Black, White and Red (or read). The other challenge was to use a print whether it was a designer series paper or stamped images. The Timeless Elegance Designer Series Paper has Basic Black or Sahara Sand images printed on Very Vanilla. It is so easy to customize your paper by adding color to the Very Vanilla portion of the designs. This card with the roses is quick and easy. All you do is sponge on Real Red onto the roses that are already printed and shaded on the paper. I also used a blender pen to color in the sections that were too small for the sponge. One of my earlier posts shows how I used the same paper and made yellow and pink roses. For this card, sponge Real Red across the entire piece of the mostly Basic Black background and use a blender pen to add Real Red to the small flowers. It's easy to "fussy cut" the strip of flowers from the 12 x 12 sheet of paper. When I first saw this bold black and vanilla stripe design, I couldn't figure out how to use it. Then I realized that I could stamp on the Very Vanilla stripes. 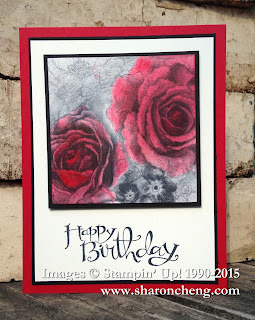 The leaves from the hostess stamp set, Floral Wings, along with the small rose were perfect for stamping onto this paper. I used Tuxedo Black to stamp the leaves. You will have some black on black where the leaves overlap onto the Basic Black stripe that adds a little bit of texture but is barely visible. You then stamp the small rose with Real Red. 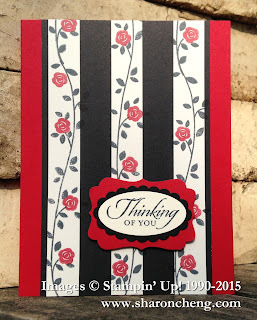 I hope you are inspired to find different ways to use Stampin' Up! 's Timeless Elegance Designer Series Paper. And be sure to visit Splitcoaststampers to see how other Stampin' Up! demonstrators met these two challenges. Here are all of my Creative Crew Splitcoaststampers Challenges for October.